If I were ask to name the chore that I dread doing most, it has to be ironing. 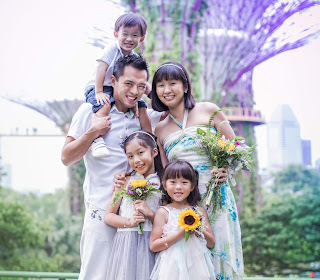 It makes you perspire a lot, it takes effort and strength, and it is not very kid-friendly since it can only be safely carried out when the toddler is not tugging your leg or worse, tugging the wires. Not to mention that you have to keep the hot iron out of reach and make sure it doesn't fall over and land on him. Yup, so trust me when I say that I want my iron to be as idiot-proof as possible and it'd better be good, quick and easy to use. Anyway, I have to really give thanks to my father-in-law who returns home late at night yet takes the initiative to take our wrinkled clothes still hanging on the rack (mainly the hubby's work uniforms and the girls' school uniforms) whenever he does the ironing. This act alone is of a great help to me and thus I do not need to set up my heavy-duty ironing board or bring out the bulky steam iron too often. However, now that we have shifted to our dual key unit and we are doing all of our laundry ourselves, there are days when I can't escape from ironing and I'd wish that I had an iron that is fast to set up, light to carry and easy to use. 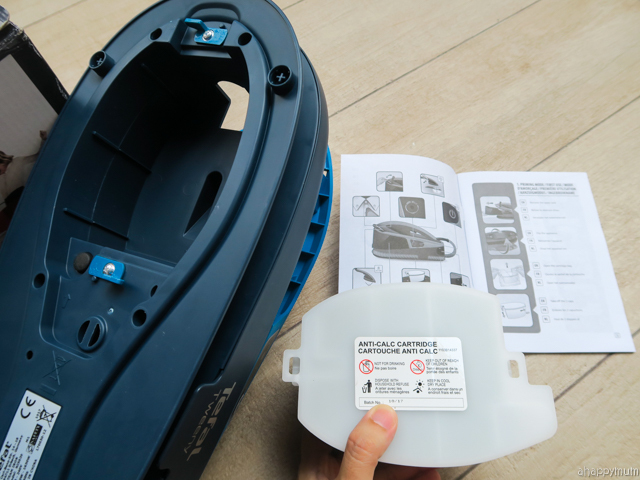 It seemed like my wish was somehow heard when Tefal sent over the Tweeny 2 in 1 for review and after having seen it in the stores, I was very keen to give it a try. Here's sharing my honest review and what we love, or not so love, about it. The first time I carried the box, I was thinking how light it felt and it made me want to ascertain that there was really an iron inside. Yup, it's definitely half, or less than half, the weight of the steam iron I was using and it made a whole lot of difference. Inside the packaging, you will find the below items. The manual gives a very concise guide on how to set up the iron before using. 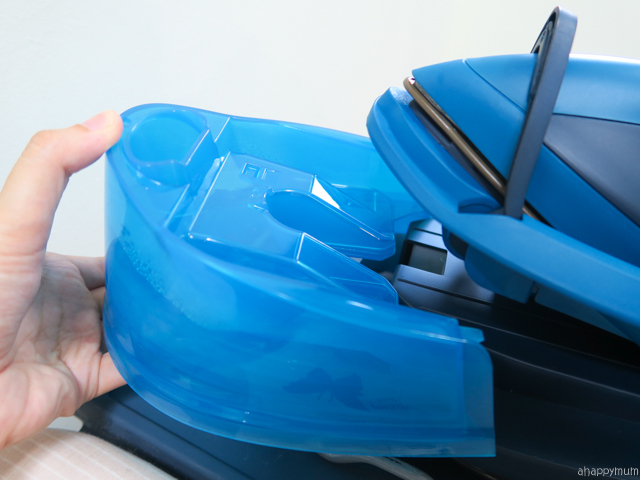 To start off, you need to insert one of the anticalc cartridges and make sure it is locked in. If you are using it for the first time, be sure to remember to follow the instructions and place the head of the iron over the sink. Top up the tank to reach the maximum water level, plug in the appliance, turn on the power and then hold it over the sink and wait for the power button light to stop flashing. This takes up to 1 minute 40 seconds and there will be an unexpected gush of hot steam, so do make sure the kids stay away and the iron is placed over the sink. Once that is done, the appliance is ready to use! You don't get to choose your desired colour since the iron only comes in one colour. I'm not sure if you do but I personally love this two-tone blue look. Not only is the iron light in weight, it also has sleek curves and a stylish design. Now, get this, there is only one button on the iron. Yes, ONE! The power on/off button. An universal setting that is perfect for someone like me because instead of having to press buttons and change modes to suit the fabric, now you just let the iron do its job. The water tank is located just below the head of the iron and can be easily pulled out from the front. Its wide opening ensures that water gets topped up to the maximum level fairly quickly. 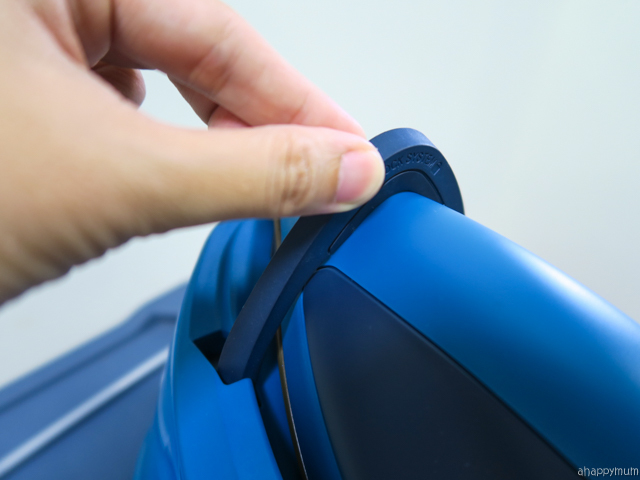 At the head of the iron, there is a safety lock which you can use to lock the iron in place. I do that every time I put the iron down because you never know when accidents might just happen - which will be disastrous if you have little ones running in the house. The handle of the iron is easy to grip and the fact that it is so light makes it easy for me to hold it even for a prolonged period of time. That is why this iron is good for vertical steaming and I can't even imagine lifting my previous iron up for more than a few seconds. 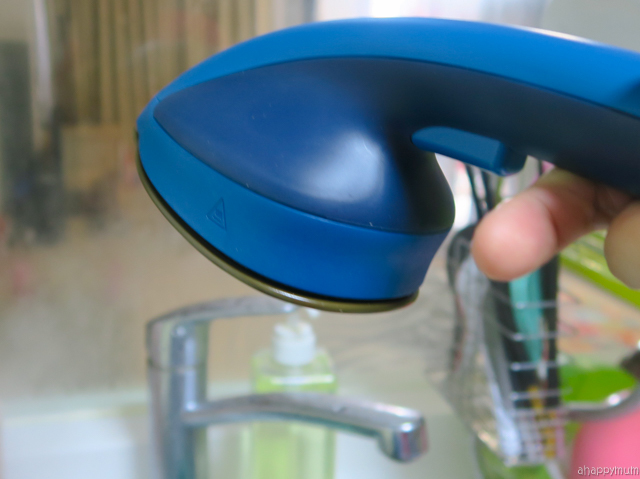 Other than the power button, there is this other steam button that you can find at the handle of the iron. You need to press it continuously when steaming and pushing it consecutively twice gives you a burst of steam that lasts for 4 seconds. Yes, that's about all you need to know about the iron! So now, we move on to usage and share with you our experience after using it a few times. Before I even begin, I have to frankly tell you, if you are hoping that you can get rid of flat ironing and only do vertical steaming from now on for your wrinkled clothes, don't. I mean, I admit I was a little naive at first and I thought that being able to use an iron vertically sounded like I could get rid of my ironing board forever. Nope, not the case. 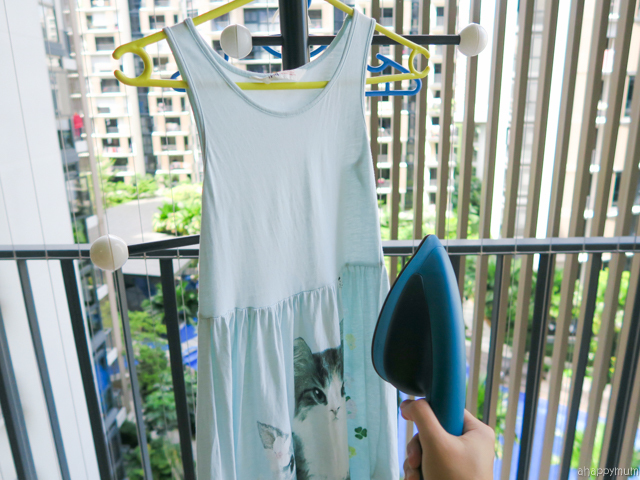 Using the iron vertically is handy when it comes to refreshing your previously ironed clothes or getting rid of just a couple of wrinkles on clothes that are not easily creased. It's also much harder than it sounds because you don't have a solid support beneath the clothing and you have to keep holding onto it to make sure it stays still when doing the steaming. So when it comes to clothing like men's shirts, bedlinen, polo tees, denim jeans etc, it's still more recommended to stick to flat ironing and in my case, I would opt to use my other steam iron since the soleplate is much bigger than the Tweeny 2 in 1 and will save time and effort. 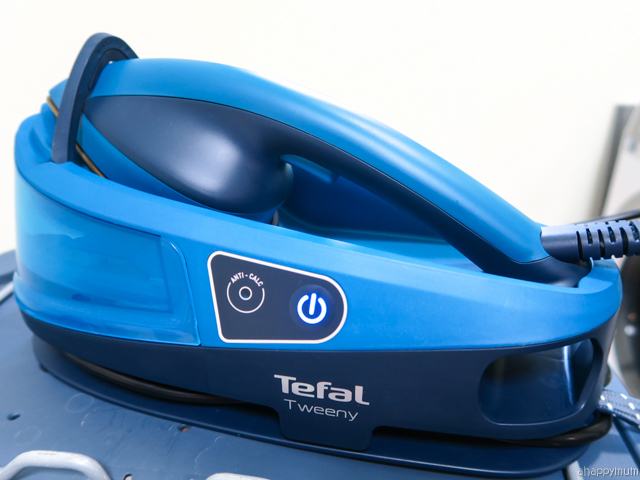 Having said that, I am glad for the addition of the Tefal Tweeny 2 in 1 to my home because there are days when it comes in handy, especially during emergencies or for last minute ironing. 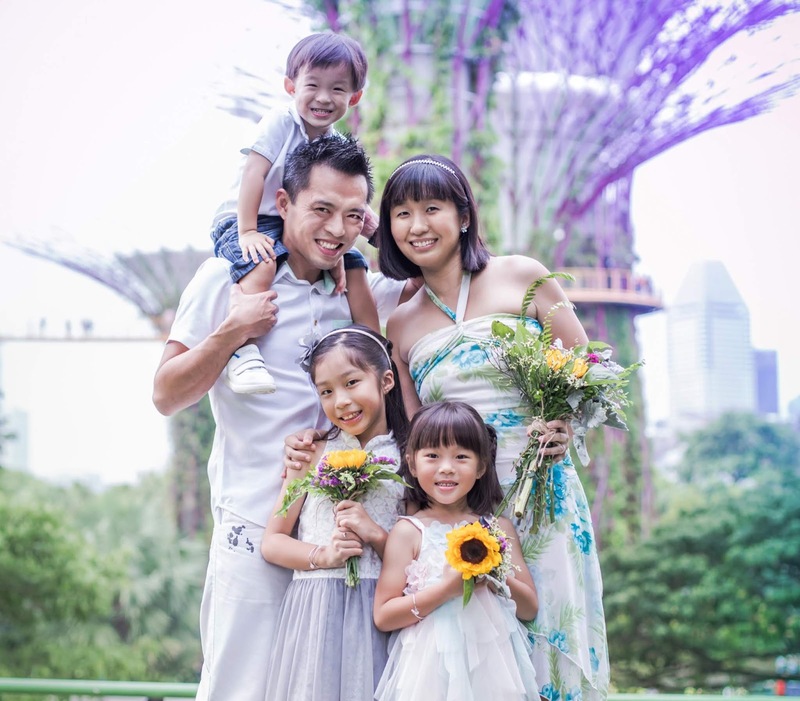 Here are some of the reasons why we love it. Anyway, for me, I'm very happy that it is so light and straightforward to use because like I said, I prefer my iron to be hassle-free and the Tweeny 2 in 1 surpasses my expectations in this area. 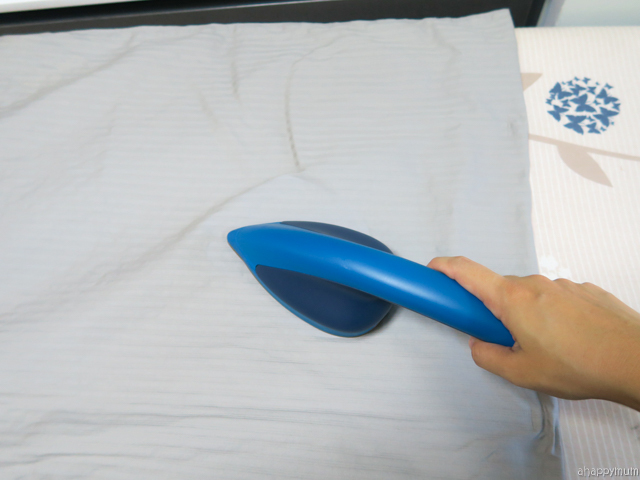 The iron, being relatively smaller in size, is very compact and easy to carry. It also doesn't require much storage space which is always a welcome to me since we don't have a storeroom in our new nest. I do wish we have space for a permanent ironing corner but since we don't, the ironing board and iron has to be set up and kept after using every single time. So, it's definitely easier having a light and compact iron in this case. Iron or steam, whichever you need. 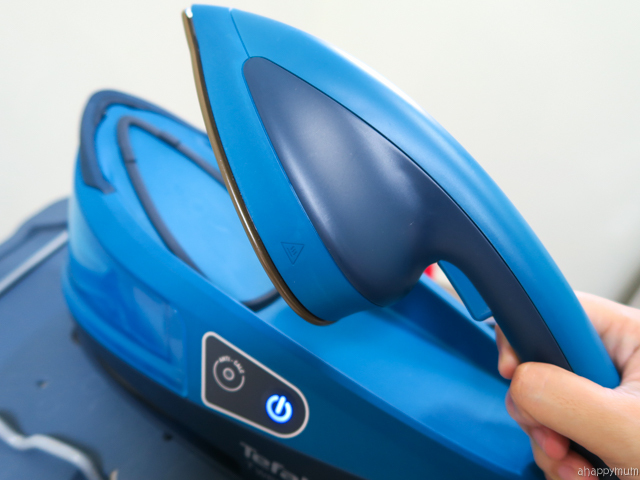 The Tweeny 2 in 1 doubles up as both an iron and a steamer so depending on your situation, it can function as any of the two. 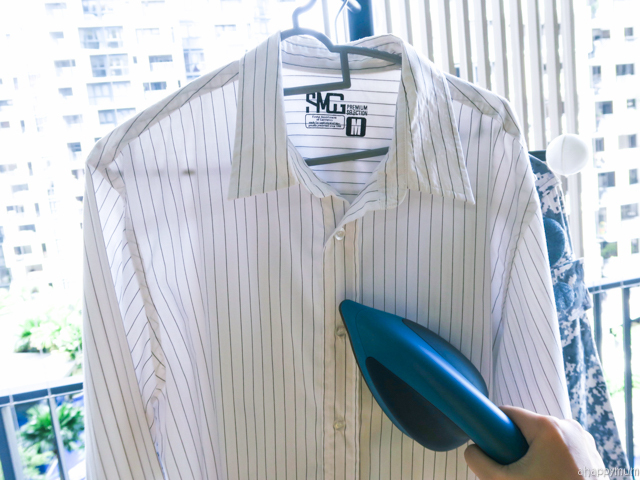 At first, I had thought that I would only use it for vertical steaming but now that I see how easy and fast it is to set up, I have used it for flat ironing on many occasions too. I mentioned that I have a heavy duty ironing board at home, right? Well, it's the kind of thing that makes you both love and dread it. Love it because the big board makes it easy for ironing bigger sized clothing; dread it because it takes effort to carry and set up. So, if we only need to iron a few pieces of clothing, I'd much prefer that we don't use the board. 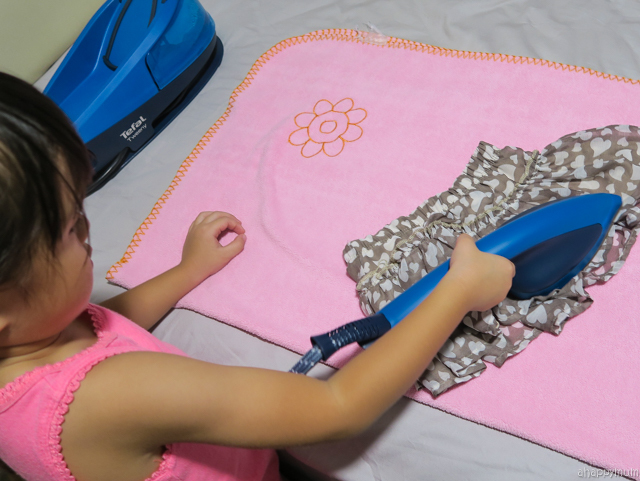 The fact that you can use Tweeny 2 in 1 on almost anywhere makes it convenient and what I usually do is to do the ironing on a bed. Yup, all I do is plug in the iron, lay a thick cloth on the bed just in case, and start ironing! Disclaimer: I don't let the small girl do ironing yet but she was so keen to try that day after seeing her sister do it (what's new) so I let her have a quick go. You will be ready, my dear, in few more years! As for what we don't love so much about it, here's a couple of reasons. The steam generated also doesn't seem to be too consistent so this might increase the time needed for a fuss-free ironing. It might be because it's easy to accidentally press the steam button twice so bursts of steam will come out. At times, there is not much steam so it leaves me wondering why. The water tank is not big, meaning that if you intend to use Tweeny to iron or steam a fair amount of clothing, you will need to top it up once or twice. This isn't hard at all, of course, but it also increases the hassle and time taken. 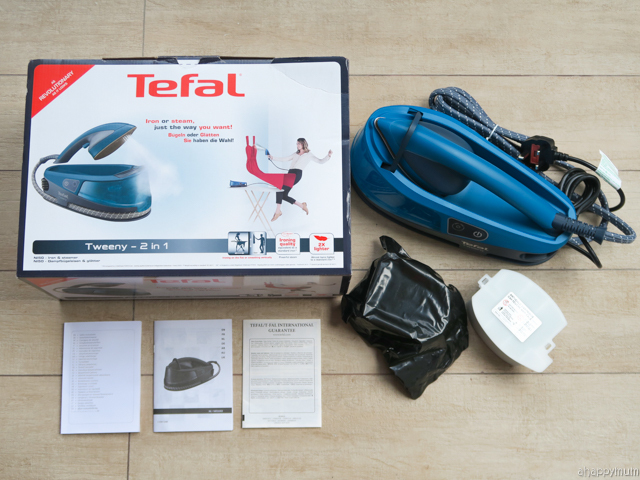 All in all, the Tefal Tweeny 2 in 1 is still a good product to have and given that it's affordable and won't cause a hole in your pockets, it will be a worthwhile buy if you are in need of a iron that is light and easy to use or in need of a steamer so you can smooth your clothes vertically. Disclosure: This is a sponsored review for Tefal and I received the Tefal Tweeny 2 in 1 for our new home in writing this. All pictures and opinions are purely my own.